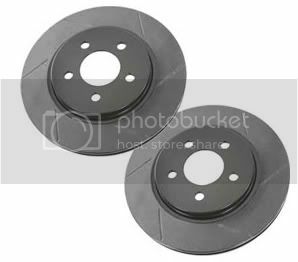 Give your 2005-2011 Ford Mustang the best in rear braking power with the ROUSH® Rear Slotted Brake Rotor Kit. The ROUSH Rear Slotted Rotors provide for better gas dissipation under braking, resulting in lower brake temperature, less brake fade, better brake bite, and improved wet weather braking. This ROUSH® Ford Mustang brake kit works with the factory rear calipers and is an excellent compliment to the ROUSH Trak Pak High Performance Brake Kit (part #403144). The ROUSH Rear Slotted Brake Rotor Kit is intended to be used as part of a braking system that will not only make your Mustang look better, it will decrease stopping distance, improve brake modulation and control under braking, improve initial bite, and dissipate and manage heat much more effectively. This and every ROUSH brake package is extensively engineered and tested by ROUSH's own performance engineers to provide optimum performance for your vehicle. ROUSH brake parts are certified over many hours on the track as well as the street. Rather than simply providing the best quality brake parts available, ROUSH takes its development a step further by finely tuning its brake offerings to the specific application as part of a whole system. The benefit of this approach is that ROUSH brake parts work seamlessly with the other dynamic aspects of your car.